Around 70% of the Irish population will suffer foot pain at some time in their lives. Where does it hurt? 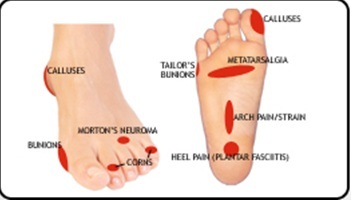 Click the red areas below to learn more about your foot pain. A good shoe fitted properly is part of the whole solution as it is not only a supporter of the foot but also contains the arch support in the proper contact with the bottom of the foot. There are many types of shoes and the shoe itself must be fitted to the person taking into consideration their age, activity level, areas of discomfort, and other individual factors. Over the counter arch supports: often, in minor problems, these devices work quite well. It would be wise to consult with a pedorthic professional as to the most effective support for you. In these minor problem cases, the over the counter device offers the type of support required to balance the foot function so that it is a more normal function. Custom arch supports are usually the best choice. They are custom formed to the individual foot and its needs. They are longer lasting and provide the type of biomechanical support necessary to aid the foot’s normal function. Arch pain refers to an inflammation and/or burning sensation in the arch of the foot. A structural imbalance or injury to the foot can often be the direct cause of your arch pain, but often times the inflammation is caused by the plantar fascia being stretched away from the heel. If the discomfort is left untreated and strain on the longitudinal arch continues, a painful bony protrusion may develop, known as a heel spur. It is important to treat the condition promptly before it worsens. A bunion is a prominent bump on the inside of the foot around the big toe joint. This bump is actually a bone protruding towards the inside of the foot and is one of the most common forefoot problems. Bunions are a common problem experienced mostly by women, and can develop from an abnormality in foot function, or arthritis, but is more commonly caused by wearing improper fitting footwear. Tight, narrow dress shoes with a constrictive toe box (toe area) can cause the foot to take the shape of the shoe, leading to the formation of a bunion. It is important for men and women to realize that wearing improperly fitted dress shoes and boots can cause the bunion to worsen. Soaking your feet in warm water can provide temporary relief in the early stages of bunion formation. The best way to alleviate the pain associated with bunions is to wear properly fitting shoes (both running and dress shoes). Shoes with rocker soles will unload pressure to the bunion area. Orthotics are also recommended to provide extra comfort, support, and protection. Other treatments designed to accommodate and relieve bunions include bunion shields, bunion night splints, and bunion bandages. These treatments can limit the progression of the bunion formation, relieve pain and provide a healthy environment for the foot. Callus formation is our body’s defense mechanism to protect the foot against excessive pressure and friction. Calluses are an accumulation of dead skin cells that harden and thicken over an area of the foot. Some calluses have a deep seated core known as a nucleation. This particular type of callus can be painful to pressure and is often referred to as Intractable Plantar Keratosis. In order to reduce callus formation, weight should be redistributed equally. An effective orthotic takes pressure off of the callused areas to allow healing. Women should also steer away from wearing high-heeled shoes. Corns are common ailments that usually form on the tops, sides and tips of the toes. Causes include tight fitting footwear, high heels, tight fitting socks, deformed toes, or the foot sliding forward in a shoe that fits too loosely. Soft corns (corns between the toes) are result from bony prominences and become soft due to perspiration in the foot. Treatments include wearing properly fitted footwear with extra room in the toe box (toe area). Avoid shoes that are too tight or too loose. Try to avoid using corn removing solutions and medicated pads. These solutions can sometimes increase irritation and discomfort. Flat feet are a common biomechanical problem that occurs when a person’s arch collapses upon weight bearing. There are many causes of flat feet. Obesity, pregnancy or repetitive pounding on a hard surface can weaken the arch leading to over-pronation. People with flat feet may not feel immediate pain, and some never suffer from any discomfort at all. However, when symptoms develop and become painful, walking becomes awkward and causes increased strain on the feet and calves. If the arch isn’t supported as you walk, it begins to collapse causing the foot to flatten and add stress to other parts of the foot. This can lead to plantar fasciitis, heel spurs, Metatarsalgia, Post-tib Tendonitis and/or bunions. Over-Pronation can be treated with over-the-counter orthotics and properly fitting footwear. Footwear with a firm heel counter is often recommended for extra support and stability. Pain in the underside of your foot at the base of your heel may indicate an inflammation caused by excessive stretching of the plantar fascia (the broad band of fibrous tissue that runs along the bottom of the foot, attaching at the bottom of the heel bone and extending to the forefoot). When the plantar fascia is excessively stretched, this can cause plantar fasciitis and can lead to heel pain, arch pain, and heel spurs. ▪ Excessive weight on the foot usually attributed to obesity or pregnancy. Turf toe is an injury to the ligaments of the big toe joint when the joint is overstretched or hyper-extended. It is commonly associated with football injuries, but can occur with any sport prone to rapid changes in direction of running (like soccer or tennis). Turf Toe was thought to be related to the unforgiving properties of artificial turf, but improper shoe selection and foot mechanics may also be risk factors. Worn out athletic shoes may also be a cause because lack of support as the shoe breaks down- allowing too much freedom of motion in the forefoot. Proper shoe gear can reduce the risk of turf toe injury and at times, a carbon fiber foot plate with a Morton’s extension can be used to reduce joint strain. Pain is typically felt between the 3rd and 4th toes with symptoms including sharp pain, burning, tingling cramping or lack of feeling in the specific area. Symptoms of Morton’s Neuroma often occur during or after you have been placing significant pressure on the forefoot area, while walking, standing, jumping, or sprinting. Morton’s Neuroma is a common foot problem caused from an abnormal function of the foot where bones squeeze the nerve usually between the 3rd and 4th metatarsal heads. This condition can also be caused from footwear selection. Footwear with pointed toes and/or high heels can often lead to a neuroma. Constricting shoes can pinch the nerve between the toes, causing discomfort and extreme pain. Footwear with a high and wide toe box (toe area) is ideal for treating and relieving the pain. Use an orthotic designed with a metatarsal pad. This pad is located behind the ball-of-the-foot to unload pressure, and relieve the pain caused by the neuroma. Have a question about eliminate foot pain? Call us now.